I really love that new designer, Kevin Dior. Never heard of him? Well, Aziz Ansari was raving about him, when asked who he was wearing at this year’s Golden Globe Awards. Catching himself, and correcting it to Christian Dior, he did what he does best and joked that Kevin was Christian’s brother, who worked at a Burbank Home Depot. I’m not convinced, however, that Ansari was or is fully aware that Mr. Dior has long left us, let alone who John and Bill and Raf are, or Yves, Marc and Gianfranco, before them. What’s that thing I always say? If you can’t pronounce the designer’s name, you shouldn’t be wearing the dress. As ubiquitous as fashion has become, I guess Christian Dior still isn’t a household name, or one that actors – who are paid to memorize and pronounce things – can all pull off. Somewhere, while you were sleeping, a French PR person died a little. That PR pro was revived, surely, by the poetic pronunciation of the brand name AND the designer’s name – ‘Kareeschian Dioh Coutuuuueh by Raf Simons’ as it rolled off of Marion Cotillard’s tongue. All of us fashion people felt a little relieved, didn’t we? Well, the woman is French AND fronts the brand she donned at the Globes this year. Cotillard did cocktail-length, scarlet velvet, complete with flaming lizard stilts. These stilts are taunting moi – look at the shape of that heel and the asymmetrical line. Will you be mine, darlings? The brand’s ambassador in a brand new couture creation by newly minted, Raf. Her hair was worn down and sleek; her presence amongst the masses, très chic. We were all misty-eyed by your look aussi, Marion. And somewhere, across ze tapis rouge, Adele had Cotillard’s dress matched, with her fiery fingertips. 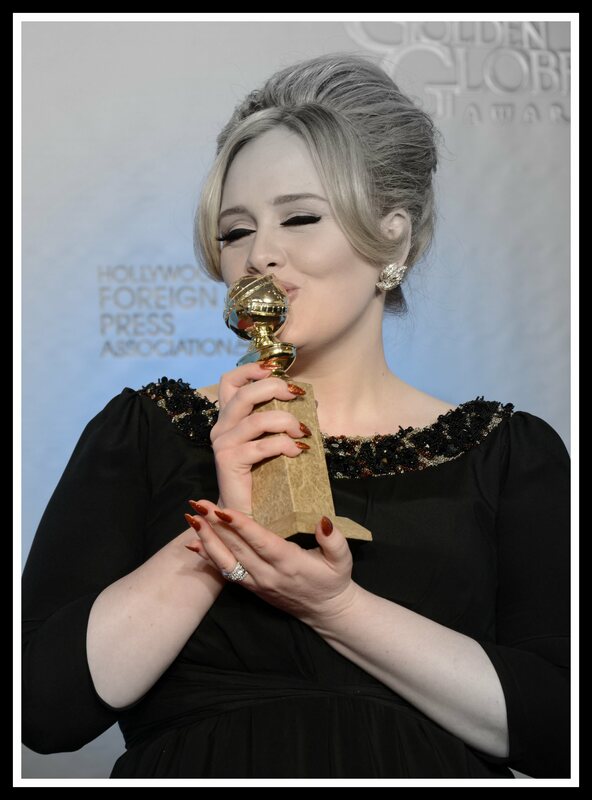 Adele kisses her award for Skyfall, and shows off her fancy fingertips, which would have matched Cotillard’s couture. Top photo by Alexandra Wyman/Getty Images North America; remaining photos of Cotillard by Jason Merritt/Getty Images North America; Adele photo by Kevin Winter/Getty North America, via the National Post.